What do you do when your third album is a huge crossover success? In Sarah Blasko's case, you ditch the producer, hire a Bulgarian orchestra and set about making your next album on your own. Blasko has been a star of Australian's alternative scene for a decade now. 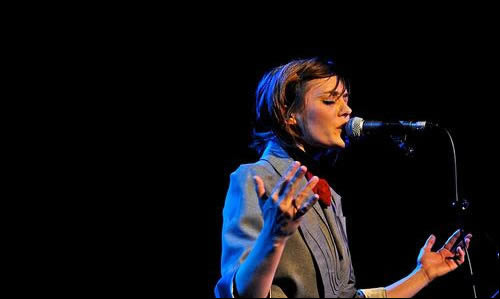 As Day Follows Night - a bittersweet set about breaking up with her former co-writer Robert Cranny - won her an Aria for best female, and was named record of the year by radio station Triple J (the Oz equivalent of 6 Music) in 2010. The album was also her first official UK release - where it won favourable comparisons to Lykke Li's debut, whose Swedish production team Blasko had hired. The singer later moved to Brighton, where she put together the demos for her follow-up, I Awake. But to commit them to tape (or ProTools, or GarageBand, or whatever format we're using in this crazy modern universe) she went back to Sweden and played her heart out in a cabin in the dead of winter. The album is out now in Australia, but us Poms have to wait 'til April to get our hands on it. Luckily, you can hear the title track (and first single) right here, right now. It opens with Blasko banging on a big bass drum, singing "I'm not scared," with a hesitancy that suggests the very opposite. Over the next four minutes, that 65-piece orchestra slowly emerges in the mix, bolstering Blasko's determination, and building to a bold, defiant battle cry in the last chorus. Sarah Blasko is touring I Awake in Europe (including a night at London's Barbican) next Spring... There's no word yet on how she'll present the songs in this hemisphere - but I really hope she replicates her Australian tour, where she played with the resident orchestra in every major city she visited, often with just an afternoon to rehearse. Sounds crazy, but incredible.